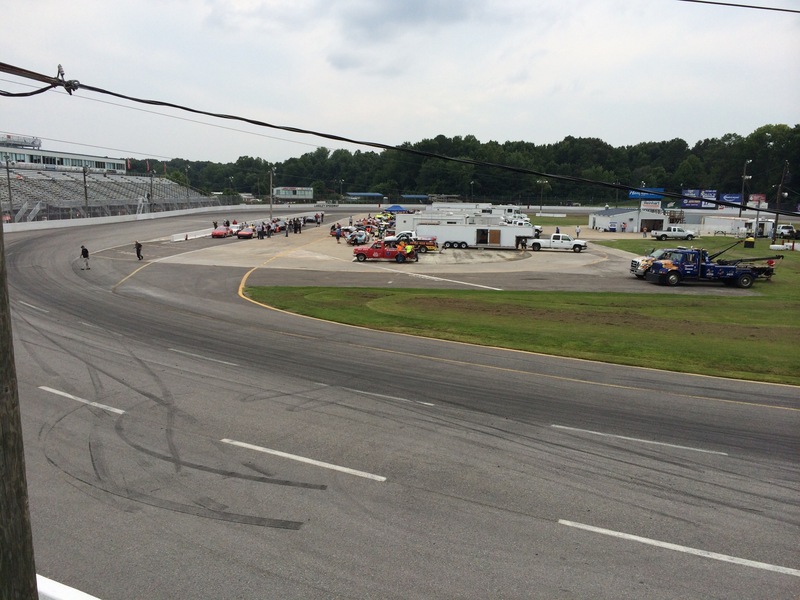 Hampton, VA – This past weekend kicked off the first of two Championship weekends at the historic Langley Speedway. 9 races, 8 divisions, and 3 champions were crowned. The weather is certainly cooling down in southeastern Virginia but the racing sure has not. Originally slated for a 125-lap season finale, track officials and management decided to split the Late Model’s into two 75-lap features and pack them into one action packed night. The annual Pepsi Grandstock 75 lapper to end the season was upon us this past weekend… well kind of. Typically Langley will close the season out with a 75-lap feature for the Grandstock division, however, due to a long drawn out battle with Mother Nature track officials decided to give these boys one last time to battle. If you ask me, I give them two thumbs up! This division has probably provided some of the best racing to report on from my viewpoint, and some of the best racing to see as a fan. If you were to ask some of the drivers and crews they might say it’s been the most stressful but they are doing what they love. Rodney Boyd would hang on in one crazy race to grab his first victory of the season. Current points leader Mark Frye was able to qualify his ride on the pole but was not able to hold off the rest of the field and ran for most of the night in the third to fifth position. Which could have been strategy thanks to Frye’s previous six wins on the season he had a rather comfortable points lead going into the weekend where his car was all but destroyed earlier this summer. With just two races left of the season Frye now holds on tightly to an eight-point lead over Sweeney. Sweeney who has really been hot on the track would bring his car home second on the night only gaining one point on Frye who finished one position behind him. The field saw an astonishing seven cautions on the evening with the “big one” so to speak on lap 67. The infamous Mark Clarr was the catalyst in this melee off turn two collecting the rides of Jamie Sample, Carl Livingston, Thomas Marks – who by the way was having the race of his season and at one point battling Sweeney for the fourth position before cutting a tire down – and Shawn Scovel leaving just eight out of the seventeen cars that took the green flag. The first feature of the night is a 15-lap INEX National qualifier for the East Coast Synthetic Bando’s. Trevor Wells lead wire to wire to pick up his second victory on the season. Even though Zach Lightfoot crossed the line second it was just enough to hold on and claim the 2014 track champion. D.J. Elzey, Elysia Potter and Bradley Wilson were the remaining drivers making up the top five. So far the finishing order has been placed on hold so to speak pending inspection from INEX officials. Shawn Gervais with a big push from Valdez & Crittenden into the lead just about half way through and was able to hold off Matthew Leach to capture his first victory this season. As the white flag waved over the field things started to get dicey at the front of the pack as the usually do. Ryan Hudgins lost the draft of Gervais & Leach and was quickly consumed by Josh Ayer & Charlie-Ray Lorah. As the field came out of for one last time, Leach tried to tuck his nose under Gervais but did not have enough power to over take him and would have to settle for second; Ayer, Charlie-Ray Lorah, and Brandon Lorah would make p the rest of your top five. Angelia-Marie Steele who came into the night just 8 points behind Charlie-Ray was only able to mount an 8th place finish. One more race on the season for these guys and gals next weekend, September 27th as Lorah hunts for his second Champ Kart title. 25 Laps in the books for the Cycle City Corps Legends division here at Langley Speedway. We have a new winner and a new champion this year. Spencer Saunders ran the fastest time in qualifying and earned himself the top spot. When the green flag dropped on the field Saunders took off and never looked back. Gdovic like that idea and followed him to the second position on the speedway. No one had anything for Saunders, he would lead flag to flag for his first win of the season. Gdovic’s second place finish was enough to clinch the title for him. Chris Hildebrand crossed the line in the third position but would later fail post race inspection, handing third over to Tommy Jackson, Jr. Though Jackson (2014 Southside Speedway points champion) would take third place points it was not enough to over take Gdovic for the championship. Took two shots to get the UCAR division underway. Ashten Mullet went for a spin in turn three, I would have to assume from the front-end damage to Keith Wheelers machine that he had something to do with it. Once the field got back in the correct spots and the tower issued a complete restart. Richard Ellis jumped out early to the top spot but was quickly tracked down and passed by point’s leader Justin Fuller. A bit of a scary moment with three laps to go off turn two. Thomas Gildea got into Mullet and she spun around. Matt Morgan, running the 11 car this evening, came of turn two with a full head of steam and smacked in the left rear of the car. Cars were scrambling all over to miss her, Fullers car made contact with the outside wall; Ellis took a high-speed trip through the grass. Fuller retained the lead, Ellis ran fourth, and Mullet rejoined the rear of the field. Morgan’s car needed a tow off the track. Justin Fuller takes home his 8th trophy of the year. Tim Wilson, Eric Shaffer, Richard Ellis and Jesse Jones make up your top five. Nelson Moody assumed the lead on lap 29 and held on for his first win in the KeesVacations.com Pro Six feature, which was extended from 30 to 31 laps by a late, race-altering caution flag. Hoping to gain ground in the title chase, Landon Florian started on the pole, at 83.138 mph, and paced the first 28 laps. Points leader Bobby Hall moved up to second on lap 2 and held down the runner-up spot for much of the contest. Sammy Gaita took the victory in one of the wildest finishes I have seen at Langley Speedway in previous years. At one point during the race the top five drivers were all nose to tail and checking out from the rest of the field. Marchetti, Gaita, Abbot, Akers, and Calway all battle for precious ground on the racetrack. After two cautions allowed for drivers to cool their tempers and tires it stacked the field up for one wild finish. With the white flag in the air the top three came off turn two practically hooked to each other’s bumper. Marchetti took one more look on the inside of Akers going into three, Gaitia wanted a piece of the action as well making things three wide on the final lap. Akers came out on the bottom of the totem pole spinning and creating an 11th place finish for him. Sammy Gaita using Marchetti as a mobile wall was able to hang on and power to victory lane; Marchetti, Calway, Abbot, and Hott completed your top five. Nelson Moody assumed the lead on lap 29 and held on for his first win in the KeesVacations.com Pro Six feature, which was extended from 30 to 31 laps by a late, race-altering caution flag. Hoping to gain ground in the title chase, Landon Florian started on the pole, at 83.138 mph, and paced the first 28 laps. Points leader Bobby Hall moved up to second on lap 2 and held down the runner-up spot for much of the contest. On a restart at lap 29, third-place Cody Carlton pulled alongside Florian in a bid for the lead. Back under green, Florian cleared him in Turns 1 and 2. At the other end of the track, though, Carlton sent Florian for a loop, bringing out the last of four yellow flags, passing the lead to Moody and sending the race into “overtime” for a green-white-checkered finish. On the final restart, Hall restarted alongside Moody, who cleared him into Turn 1. As they came around to receive the white flag, however, Hall ducked underneath the leader. Moody and Hall raced cleanly and side-by-side for the last circuit with Moody eking out a half-length victory. Officially, the margin was 54-thousandths of a second. J.B. Sipe was third to the checkers, while Florian salvaged a fourth-place result. Maddy Mulligan overcame a late spin to post her first top-five finish of the season. Hall will bring a nine-point lead over Florian, 198-189, into next Saturday’s 30-lap finale. Steve Williams, who was second in points coming into Saturday’s event, saw his title hopes take a big hit as he was sidelined by early mechanical problems and ended up 13th.